Meaning of Love all, trust a few, do wrong to none Quote by William Shakespeare. 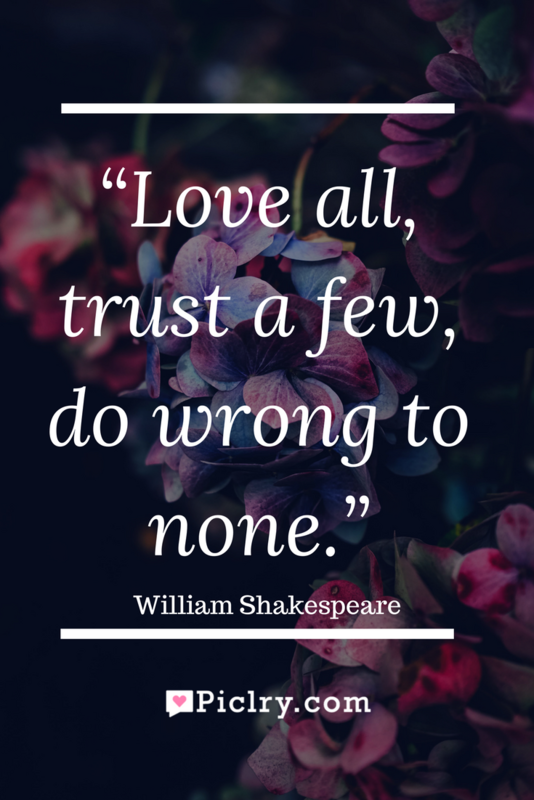 This line is from the play by William Shakespeare named ‘All’s Well That Ends Well’. It is an advice given by a mother to her son, who is being sent away to some court after his father passed away. This is an advice we can adapt in our real lives as well. This proverb can be explained in three parts. Love all, by loving everyone; you are opening your heart to everyone, even to those who doesn’t love you back and those who don’t carry your best interest in their heart. Next part asks to trust a few. By not trusting everybody or many, you are protecting yourself. There are many who will betray you and are always ready to stab on your back so trust a few. Do wrong to none; this will help you generate a good reputation. It will also help you in winning some favours and hearts. Once you learn to read and love to read, then you can really conquer anything.